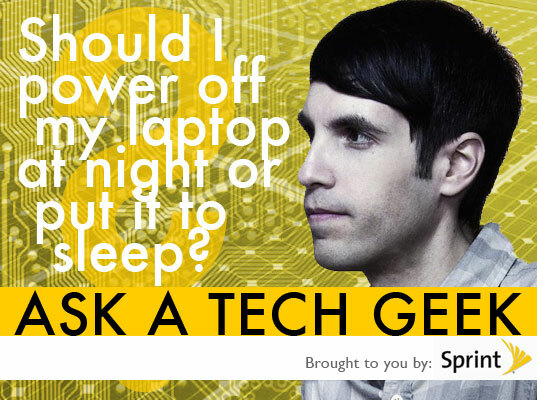 Each week renowned gadget expert Peter Rojas from gadget Q&A site GDGT.com answers your questions about green technology in our Ask A Tech Geek Series. Read on for this week’s installment and submit your questions below! QUESTION: I’ve heard that it’s better to keep a laptop on sleep mode rather than shutting it off completely. Why is that the case? What would you recommend? What you’re probably referring to is the concern that frequently shutting down and booting up causes stress to your computer’s hard drive that over time will culminate in catastrophic failure — and almost certainly at the worst possible moment, like when you’ve just finished a term paper. Read on to learn the greenest state for your hard drive. 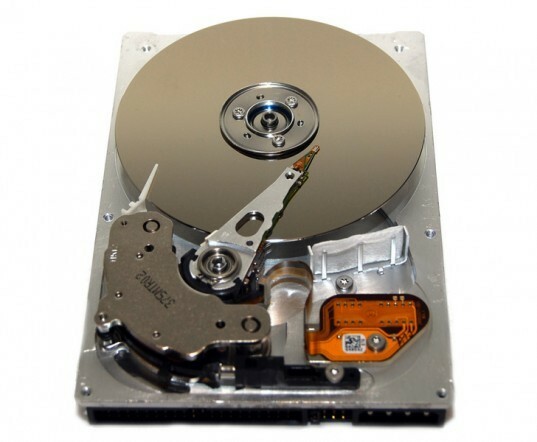 While it’s true that hard drives are complex mechanical devices that simply will breakdown sooner or later, the truth is that you’re far more likely to damage your drive from simply dropping your laptop — especially if it happens to be reading or writing data while it happens — than from the accumulated stress of booting it up every day. As long as you shut your computer down properly you shouldn’t have a problem; hard drives have really improved in quality over the years. Eventually drive failure won’t be an issue at all — more and more computers are coming with solid state drives that don’t have any moving parts at all. So, while you shouldn’t worry about breaking your computer by shutting it down every night, there are a few advantages to putting your computer to sleep rather than shutting it down. The biggest is convenience: if you’re waking it up from sleep mode you don’t have to wait for your machine to boot up before using it. Even though a couple of minutes might not sound like a long time, it can feel like forever when you’re sitting there waiting for everything to get going. You’ll also be able to pick up right where you left off, whereas if you shut down and reboot you’ll need to restart all of your applications. The big disadvantage, of course, is that when you put your computer to sleep it’s still drawing power. If your goal is to conserve energy, shutting down completely is your best option. However keeping a computer in sleep mode requires very little energy – they usually draw about a tenth as much power as a computer that’s fully on. It’s not insignificant, but it’s typically not much more than a nightlight. WANT TO ASK A TECH GEEK? Do you have a green technology question you’d like to ask Peter? Submit it to him by leaving a comment on this post or tweeting it to @Inhabitat and/or @peterrojas with the hashtag #AskATechGeek! i recommend turning the computer off. i've experienced decreased computing performance after hibernating instead of rebooting for a few days straight. i recommend to turn it off. Lo Studio Paci, Dottori Commercialisti e Revisori Contabili in Milano, offre ai propri clienti un servizio multidisciplinare integrato di consulenza contabile, societaria e fiscale. We have laptops for work that are on a network, and at the end of the day when I want to go home, I have documents that I'm working on that I don't want to close (various things, such as Lotus Notes, internet pages, and Excel files/ Word files. We use synchronization with the network for our user files. As I leave, I will select the option to standby or hibernate and go home to pick up where I left off. Then when I'm working away from a power source, I shut the lid so I have battery power and come back towork on it. Here's where the issue gets sticky. I am the user, and we have tech support guys who say that this is a bad way to use the computer and that I should synchronize, shut it down, and go to the next place. Then start it up and work again... as our synchronization takes a while or I'm just going to a conference room, I don't want to shut down --- The techs say that it's the computers aren't designed that way, and that is causing a problem. I say they are encouraging a mobile work force, and the techs need to give us guidance/support for how we work in this mobile environment. So why is it bad to shut it to standby/hibernate when you need to conserve power (during a meeting) or traveling to your next meeting? They absolutely abhor the hibernate...? So is it better for me to leave my computer in sleep mode during the day or to shut it off completely? ecochick2, please further define what you mean. In the way of power use, modern laptops the pinnacle of efficiency and low power use. Netbooks are even lower. Tablets I believe are slightly less power hungry than Netbooks, but I have friends reporting that flash-based web sites don't work well on their tablets. are there any eco friendly laptops out there? Honestly, forget sleep mode and put it into hibernation. This copies memory and the system state to the hard disk and completely powers down the computer. Like sleep mode your system does not require a complete boot, but uses no power to keep it in stasis. In the realm of HDD wear, all new laptop drives have a specific landing zone. When it is not reading and writing to disk the head inside is parked over this spot. 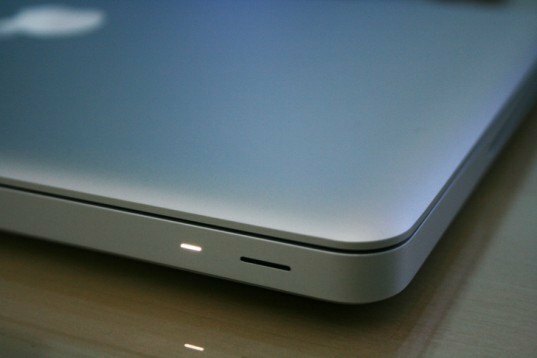 If you drop the laptop or shut it down the head is left in this spot. This way if anything destructive happens during shutdown or sudden movement then none of your data is harmed. As some have pointed out, modern computers use electricity even when shut down. Then question is how much more does stand by use, and in my experience it's hardly any at all. I used a calibrated power consumption meter I loaned from a local power company to test couple desktop computer. Dell Optiplex 780 SFF used 3.0W while shut down, 3.3-3.4W on stand by and during startup it used 1.3Wh of electricity. That means if you keep the computer shut down less than 3-4 hours you would have used less power to leave it on standby. A computer built from third party components by a smaller OEM used 8.1W while shut down, 8.2-8.6W on stand by and 1.6Wh during startup. For modern electric devices stand by mode really isn't much of an issue. Few years ago a TV might have used 30W on stand by. On tests this year that I've seen they used only couple watts or even under 1 watt. When I am on Facebook and Farmville, my CPU is running at 100 percent. My laptop heats up. The fans have plenty of room to work with the cooling. Is this bad for the system? I have windows xp with a 1.73GHz intell pentium processor. and One GB of Ram. The CPU often peaks at a hundred percent. I can see it on the Task Manager. People tell me the computer is supposed to get hot. Others say I need more Ram. If you put it in sleep mode then the "state" of the computer is put into RAM and constantly refreshed with power.. the most efficient and middle would be to use "hibernation mode" this saves the "state" to the hard drive instead and the computer turns off.. when you turn on it takes what would usually be in the constantly powered RAM from the solid Hard Drive instead.. Once in hibernation you can unplug the computer if you wish but it only takes a few seconds longer then sleep mode and you keep your state, just like sleep mode. i've always wondered about this, and as someone who doesn't shut down, this is great news. Many of the modern day myths about computers are rooted in the past, when stuff wasn't as good. LCD monitors do not suffer burn-in like old CRTs, so the concept of a "screen saver" is now more a security device to lock out your PC after you've been gone for a few minutes. Hard drives are more intelligent now and less prone to the power spikes of start-up. Modern laptops using Intel's SpeedStep technology step down their power usage when a system goes idle and can turn off parts of the CPU itself. You do realise that all computers turn off the hard drive in sleep mode and when shut down (and after inactivity when turned on)? So it would not matter what you did. Also even if shutdown a laptop it will draw power to charge the battery. So any energy saved would be fairly insignificant. This is a question I always wondered about. Thanks for shedding some light Peter! Great tips... I've always wondered about this and now I have a definitive answer. Thanks, Peter! 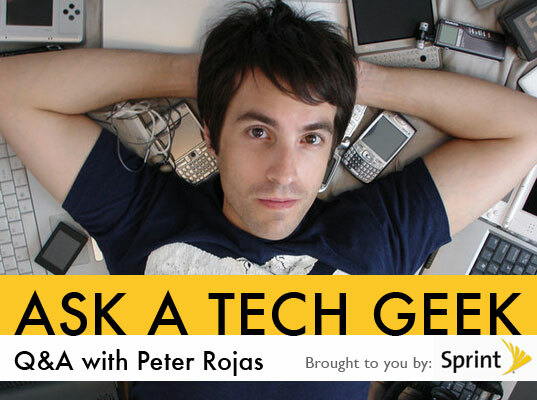 Each week renowned gadget expert Peter Rojas from gadget Q&A site GDGT.com answers your questions about green technology in our Ask A Tech Geek Series. Read on for this week's installment and submit your questions below!